Anglesey is renowned for its lush pastures making it the perfect place to raise livestock. We are very proud to rear and sell delicious Welsh Black Beef, Wales’ native cattle breed. Our cattle are grass fed and hung for a minimum of three weeks after slaughter, making the meat tender and full of flavour. Our beef is traditionally butchered and sold in a wide variety of cuts. We really believe you can taste the difference! Our home reared Pork is reared for flavour, the pigs often enjoying tasty vegetables including asparagus trimmings! We butcher the pigs into a variety of pork joints and chops. Legs and loins are dry cured to form bacon and hams, shoulders are turned into our award winning homemade sausages. The range includes Old Welsh, Pork & Leek, Cumberland, and many more. Our delicious Welsh Lamb comes from our own ewes, the majority of which are Lleyns, a very local breed. Our lamb is butchered into beautiful joints and available 12 months of the year. We also offer our own mutton, delicious when slow cooked. We sell delicious Welsh, free range chickens from Capestone Farm…an award winning, family run business. Choose from succulent whole chickens, as well as breast fillets, thighs, drumsticks and wings, which are all butchered on site. At Christmas we have our own delicious home reared, free range Bronze Turkeys. We also stock a range of gluten free and additive free sausages and burgers, available from the freezer. There really is something for everyone! 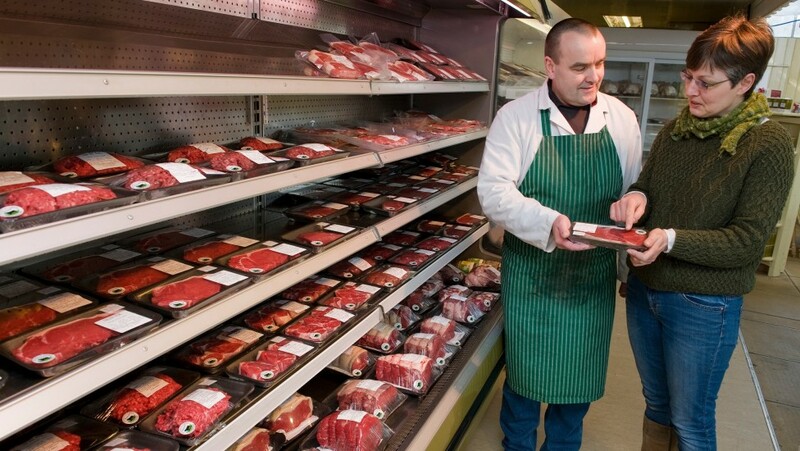 Our three butchers are on site in our Brynsiencyn Farm Shop throughout the week, and are available to offer advice and cooking tips, and also for any specific cuts that you require. We can deliver our produce to anywhere in the UK…so you don’t have to miss out if you don’t live locally! We use an overnight courier service, guaranteeing delivery day of your choice, and cool boxes and ice packs are used where needed to ensure freshness. Call us on 01248 430322 or use the email form on our ‘Contact Us‘ page.